I read a wide variety of books, but one of my favorite genres is historical fiction, especially when the setting is medieval, so when I learned of Prentice Ash, a fantasy that takes place in a late medieval world, I purchased it with the hope that it would prove as interesting as its blurb and preview suggested. Prentice Ash could easily be historical fiction were it not for the fantastical elements. But as I love fantasy as well, I didn't mind. It was the best of both worlds. I thought of writing a book review, but an author interview not only showcases the book, but gives a little publicity to the author, which I am happy to do. 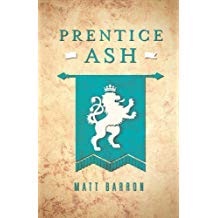 Without further ado, my interview with Matt Barron, author of Prentice Ash. Q: So tell us about Prentice Ash. What's the story about? A: Prentice Ash is a fantasy story set in a Christian medieval world. The main character is the titular Prentice who through the events of the story acquires the second name Ash. Prentice is a convict, condemned for heresy. His nation, the Grand Kingdom, uses convicts as combined forced labour and cannon fodder. When the book starts, Prentice has been a convict for over a decade and he and several other convicts get caught up in an ambush of the province's ruler, the young widow, Duchess Amelia. Mysterious invaders have come from the plains beyond the western border, a supposedly uninhabited wasteland. They attack the Duchess' entourage and only a handful of knights and convicts escape the assault. Through his actions, Prentice earns the Duchess' trust. Although officially she rules the province, the Western Reach, she has few allies among the knights and nobles. Her husband has only recently died and she was not long married before that. She makes Prentice her ally because he is beneath the politics and because, before he was a convict, he was trained as a knight. He understands warfare. As the book progresses Amelia works to keep her position as ruler of the province against the political machinations of ambitious knights and even of the crown prince, who comes west to help defend the province. Prentice just tries to stay alive, giving advice to his liege lady when she asks. Finally, the Grand Kingdom army meets the invader force in pitched battle. For the rest of the story, you'll have to buy the book. Q: Of all the stories you might have written, you chose to write this one. Why? A: Why Prentice? Good question. I'm a big fan of serialised stories, both historical and fantasy/sf. I like Bernard Cornwell's Sharpe books and C.S. Forester's Hornblower stories. I wanted to start my own series of stories and Prentice Ash is the character I created for that. Both Hornblower and Sharpe are military men in the Napoleonic era and I would have liked to do a fantasy similar to that period, but Brian McClellan's Powdermage books do such a phenomenal job of a fantastical Napoleonic style era that I would feel like I was re-treading his ground too much. Instead I chose another period, that of the Thirty Years War. It's a fascinating period, with knights being the kings of the battlefield, but about to be overthrown by the advent of gunpowder and massed infantry; the arrival of the professional soldier. That's who Prentice will become as the stories continue, a prototypical general. I'm also fascinated by many aspects of medieval culture and history that tend to be glossed over. The great part of the Song of Ice and Fire, for me, is the way that George RR Martin anchors his fantasy world into a historically consistent medieval culture. He doesn't shy away from the grimness of such a historical period; in fact, sometimes he almost seems to revel in it, which I know puts some readers off. One of the key features of the Thirty Years War is the conflict between Christian denominations and the way faith is mobilised by rulers and governments to legitimise their wars. That's a theme I really want to pick up with my Prentice stories—conflicts of faith, both true belief and mere religious ritual. Q: What is your favorite part of the story? A: I think my favourite part of the story is after the main battle. I really wanted to confront the Hollywood style victory, where a bunch of mildly unkempt heroes brush themselves off and are cheered by all and sundry. The hero gets the girl and all the doubters and scoffers are put in their places. I know it's not wrong to enjoy that sort of thing, but it often feels too neat. That's why my ending isn't quite so neat—I can't talk in too much detail without spoiling the ending, but if you've read the book you'll understand what I mean. I also worked hard to make people a product of their culture. Too often nowadays writers put what they call a "strong female character" into the story and what they mean by that is that they put a modern feminist teenager anachronistically into a medieval world and they proceed to overturn everything, like the medieval era is a conservative high school that just needs a good dose of modern thinking. My female main character, Duchess Amelia, is a strong woman, but she's not ignorant of the realities of her world. Just because she's a duchess, doesn't mean her rank and privilege can't be taken from her by powerful institutions or individuals. Her strength is in keeping her Duchy, in protecting her people and her husband's legacy, since that legacy is what gives her the status she enjoys. She's not a wild teenager demanding equality; she's a wise and insightful young woman holding onto her power and protecting her people through cunning and sheer force of will. Q: Are there any influences that shaped your story (other books, ideas, interests, etc.)? A: As far as influences go, I've already cited Cornwell, Forester, McClellan and Martin. Those are the big four, as far as I'm concerned. Martin's Song of Ice and Fire is especially strong, because it shows the way that history and fantasy can interact. When I tell people that Song of Ice and Fire is clearly the War of the Roses turned into a fantasy (Stark vs Lannister = York vs Lancaster) I'm surprised by how many people never noticed. I'm a historian by education (I have a PhD in History) so to me it was obvious. Maybe it is obvious and it's just a few people I've spoken to who didn't get it. But that's probably my number one influence and goal—to do a fantasy Thirty Years War the way Martin did the War of the Roses or McClellan has done the Napoleonic wars. Q: If there were one thing you'd want the reader to take away from Prentice Ash, what would it be? A: I think a great story is my first aim. To entertain is top of my list. I also like to portray real life situations in an interesting way, if I can. One of the greatest compliments I've ever received was that I managed to create the sense of a real world, as if my writing were giving a window to somewhere real, rather than something purely fictional. That was a good day, when I got that compliment. Q: Where does the story go from here? A: Last year I started writing Book 2, but the story I imagined ballooned to the point where it was too much for one novel and so I've had to go back and start again, splitting the planned story across Book 2 and Book 3. So now I begin a new Book 2, where Prentice must help Amelia consolidate her position as Duchess of the Western Reach, beginning with retaking her capital, Dweltford, which has been seized by a rebellious noble. If everything goes to plan the first draft will be done before the end of October. A publisher has asked to see a copy, so I'll send it to them then. Either way, a publication date (either with the editor's company or self-published) should be known by the end of the year. In the meantime, I've also written a couple of screenplays that a company here in Australia is trying to develop into feature films; so next year could be a big year for me. I sure hope so. Thank you, Matt, for being willing to be interviewed. I wish you all the best with the sequels to Prentice Ash and with your other endeavours. It's very exciting and I look forward to reading Book 2 whenever it is released. Matt Barron went to university to find a girlfriend and instead was found by the Lord. He stayed at university many years to witness the truth and love of Jesus; in his spare time, he picked up a Doctorate in History and Cultural Studies. Since the heady days of his youth, Matt has been on a quest to be a worthy Christian husband and father. His companions on this pilgrimage are his beloved wife of twenty years and his two delightful children, who are so well raised that they still laugh politely at his jokes (sometimes). You can purchase Prentice Ash on Amazon or at Bookbaby. Matt can be reached on Facebook and at his website.